Determination of acetic acid concentration in commercially available white vinegar is one of the simplest and easiest titrations. It is also possible to determine concentration of acetic acid in other types of vinegar. The only problem is that the color of the vinegar can make it difficult to spot the end point. However, in most cases even vinegars made of red wine - after being diluted for titration - are pale enough so that the phenolphthalein color at the end point can be easily spotted. We have to remember that vinegars - apart from some distilled versions - contain also many other organic acids, responsible for the vinegar flavor. Their concentrations are usually low compared with concentration of acetic acid, but to be precise we should mention that we are determining not just acetic acid, but sum of all acids present in the vinegar. As it was already discussed in the titrant and sample volume section, volume of the acid titrated should be selected in such a way, that we will use about 80% of our burette during titration. As we are dealing with solutions that have their concentrations listed as mass percentage, it may be worth of knowing how to convert percentage to molarity, if the solution is more concentrated acetic acid density table may come handy as well. Vinegar sold can have different strengths. Most popular are concentrations between 4% and 15%, but sometimes it is available as a vinegar essence (Essig Essenz), with concentrations of 25% or even 80%. In case of such concentrated solutions it may be impossible to simply take a single sample for titration. When using 50 mL burette and 0.1M NaOH solution (quite typical situation) correct volume of the 80% vinegar is in the range of 0.3 mL. We won't be able to measure such a volume of liquid with reasonable accuracy, thus we are forced to dilute the original acid - say, taking a 5 mL sample and diluting it with a distilled water to 100 mL in a volumetric flask. That gives us solution that is about 4.3% - and taking again a 5 mL sample of this diluted solution we can safely titrate it using 0.1M NaOH and 50 mL burette. Unfortunately, to dilute the solution we have to measure the volume one times more - which means one additional source of errors. This additional step has also to be accounted for during calculations. Sometimes this is inevitable. 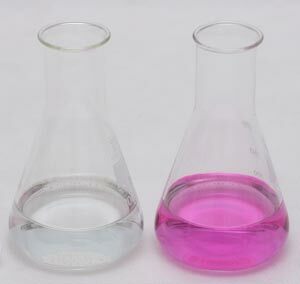 Depending on the concentration equivalence point of acetic acid titration lies somewhere between pH 8 and pH 9. When titrating with base phenolphthalein starts to change its color around pH 8.2, which makes it a perfect candidate for the end point detection. Titrate against phenolphthalein to the first visible color change. To perform titration we will need titrant - 0.2 M or 0.1 M sodium hydroxide solution, indicator - phenolphthalein solution and some amount of distilled water to dilute acetic acid sample. Pipette aliquot of acetic acid solution into 250mL Erlenmeyer flask. acetic acid reacts with NaOH on the 1:1 basis. That makes calculation especially easy - when we calculate number of moles of sodium hydroxide used it will be already number of moles of acetic acid. To calculate acetic acid solution concentration use EBAS - stoichiometry calculator. Download determination of acetic acid in vinegar reaction file, open it with the free trial version of the stoichiometry calculator. Click n=CV button above NaOH in the input frame, enter volume and concentration of the titrant used. Click Use button. Read number of moles and mass of acetic acid in the titrated sample in the output frame. Click n=CV button in the output frame below acetic acid, enter volume of the pipetted sample, read acetic acid concentration. Once we know molar concentration of acetic acid, we can calculate percentage concentration of the acid. That will allow comparison of the advertised concentration with the real one. We have already explained elsewhere how to convert percentage to molarity and molarity to percentage. However, exact conversion can't be done without density tables. To get approximate values we can assume acetic acid density to be around 1.005 g/mL (for 5%) and 1.013 g/mL (for 10%). For precise conversion download free trial version of the concentration calculator, run the program, start concentration calculator, select acetic acid from database and enter calculated molar volume. Program will convert molarity to other concentrations, estimating solution density. Apart from general sources of titration errors, when titrating acetic acid we should pay special attention to titrant. Sodium hydroxide solutions are not stable as they tend to absorb atmospheric carbon dioxide. Acetic acid is stronger than carbonic acid, so it will slowly expel carbon dioxide from the solution, but initially presence of carbonates will mean that to reach end point we need to add axcess of titrant. Page was last modified on September 06 2009, 00:13:33.